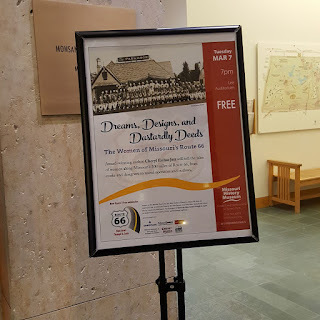 On March 7, I gave my new program, "Dreams, Designs, and Dastardly Deeds: the Women of Missouri Route 66," at the Missouri History Museum in St. Louis. Wish you could have all been there! Some of the stories I shared were: Julia Chaney, cook/owner/operator at Red's Giant Hamburg; Mayme Ousley, four-term mayor of St. James; outlaws Bonnie Parker and Blanche Barrow; and the women of the Boots, Wagon Wheel, and Munger Moss motels. I hope to have a couple more bookings of this program to announce soon. Watch for an article on some of the Missouri 66 women in the summer issue of Show Me Route 66, the excellent quarterly publication of the Route 66 Association of Missouri. 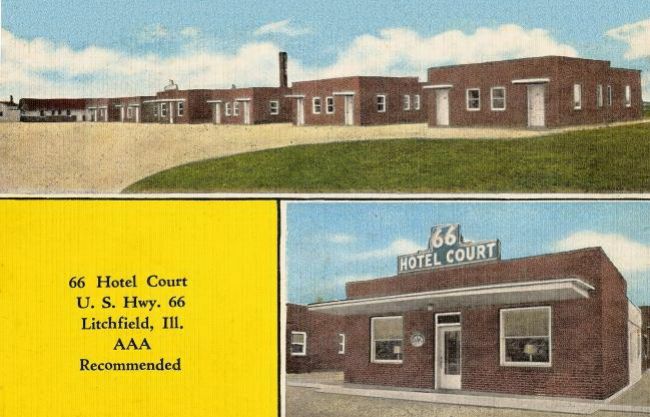 My column in the next issue of the Buzz will be about the Mansholt family--particularly the women--and their hotels in Litchfield, Illinois. 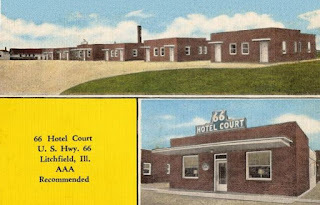 The Mansholts, now well into their second generation in the hospitality business, began with the purchase in 1963 of the 66 Motor Court on the 1930-1940 alignment. Story and photos will appear in the April issue of the Buzz, published on or about April 1. As always, you can read it online at www.thebuzzmonthly.com. If you live in Madison, Bond, Macoupin, or Montgomery County, you can pick up a paper copy at numerous libraries and businesses. I'm working on an Illinois Women of 66 program--it's in the development stage! I think the title of that program will be "Adventurers, Crusaders, and Entrepreneurs: The Women of Illinois Route 66." As with the Missouri program, there'll be a lineup of diverse, persistent, and strong women included. So far, I have this program booked for the Macoupin County Historical Society in Carlinville on Monday, October 2. (Public is welcome and invited.) I'm sure this is going to get booked other places and dates. Also in October, I'll be speaking at one session of the third annual Miles of Possibility Conference! The third annual "MOP" will be held in Joliet, and my topic will be something to do with the women of Route 66. Of course, the Missouri and Illinois women mentioned above are included in the early draft of my book (working title) Women of 66: and Their Extraordinary Contributions to the Culture of the Mother Road.